This spa as a natural healing place has existed since Roman times. The remains of the Turkish bath witness the importance of the healing water in the periods after that, and today Katlanovo Spa is the most often visited center for long-term treatment of fractures, injuries and sterility. There is an idea in future that this spa complex be developed into a modern relaxation center, which opens a new window to the unutilized possibilities of this nature given treasure. Katlanovo Spa is located 23 km southeast of Skopje, at about 3 km of the highway Belgrade-Skopje-Athens, at 230 meters above the sea level. Located by the babbling waters of the Pcinja River, it is a real paradise for stay and relaxation because of the mild continental climate and fresh mountain air. This spa is a real rarity in Europe. It is among the group of alkaline bicarbonates waters, highly mineralized. On the German scale of water hardness it is ranged at the highest placed, since it is incredible rich in minerals. It is envisaged as a complex of three partsrehabilitation part, with one big and one family pool, as well as individual tubs for Kinezy therapy. The water in the pools is brought directly from the spring, located at a distance of 980 meters. The temperature of the water in the spring, which is 85 meters deep, is about 60 degrees centigrade, but when it reaches the pools it’s cooled and reaches 40 degrees. The pool part for rehabilitation is completely reconstructed and arranged in a very modern way. If you look for privacy, there is a small pool thatyou may use with your friends. After the relaxation in the warm and rich with minerals water, rest on the chairs, order a drink and enjoy the nice music. After that, in the modern equipped tubs let yourself to the hands of the therapists. After the Hydro-Kinezy therapy, believe me, you will feel as if born again. For those that take care of their look, a small wellness center was opened, where medical cosmetic is applied. The visitors have at disposal a spa capsule or oxygen capsule, which contains treatment with infra red light, oxygen and aroma-therapy, which helps the relaxation and the detoxification of the body as well as stress-relieve. Especially attractive is the LPG apparatus for strengthening the muscles and cellulite removal. There is a personal trainer in the center, who helps to passively put in motion the muscles, as well as a computerized apparatus for physical therapy. Katlanovo Spa plans to grow into a famous relaxation centre, whose aim is construction of a special pool and wellness (spa) center. It would be equipped with Finish sauna, Turkish and Roman bath, dead sea pool with hypersalty water for detoxification of the body, then big jacuzzi and recreation hall, where with adequate music, chairs with vibration massage and adequate lights, a complete relaxation of the body would be enabled. The wellness center would lead to an outdoor pool that would be heated. Thus during winter, you may go out of the spa, cross the warm bridge with water and bathe in the out- KATLANO VO SPA door pool, regardless of the weather conditions. Imagine what an experience would be to havea bath outdoors while it’s snowing around! The capacity of Katlanovo Spa is about 200 beds, and underway is reconstruction of the hotel, which should become a luxury accommodation capacity. Within the spa there is a restaurant with Macedonian cuisine and diet food. The health activity in the spa is realized by 40 medical persons, among which specialists, physiotherapists and internists. Katlanovo Spa has existed since the time of Justinian and was marked on the Roman map in year 340. The water composition is rare in Europe and enables treatment of all degeneration illnesses, such as chronically and inflammation rheumatism, all conditions of fractures and traumas, all conditions of post-surgery interventions where corrective surgery interventions are made or artificial replacement of hips and knees. The water in Katlanovo is especially famous for the treatment of inflammation of the women’s genital organ, healing sterility of both men and women. An incredibly big success is made in healing fractures. The made analysis show that only the springs of the Grand Vichy spa in France have similar composition of minerals to the waters in Katlanovo. It provides a new opportunity, planned to be developed-using the mineral composition of the water, since annually, from the pipeline and the cleaning of the pipes of the pool complex, several tones of solid, dry remains of calcium carbonate, which contains other minerals, are being extracted. This is very good for developing a cosmetic line that Grand Vichy owns, and that is the famous “Vichy” cosmetics for women. 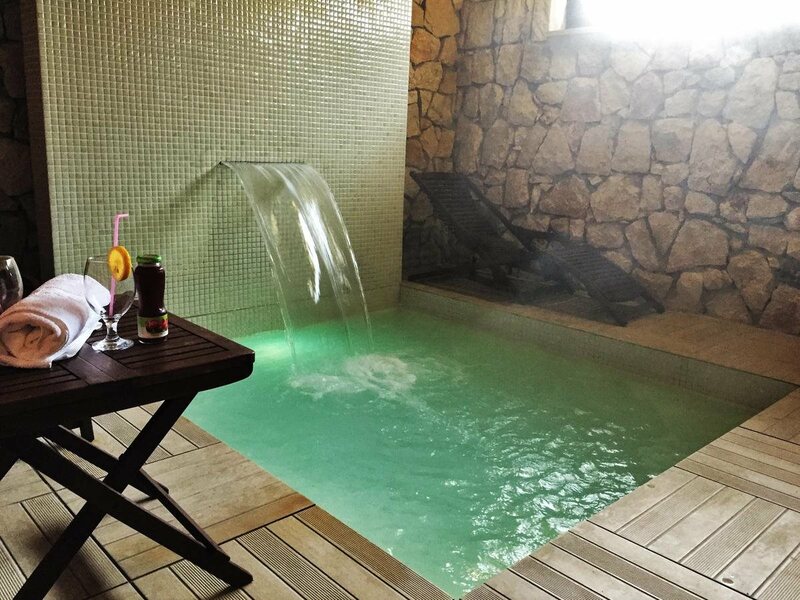 Near to the city of Gevgelija, by the regional road Thessalonica-Skopje, Negorski Spa is located. It is in the foot of mountain Kozuf, at 50 meters above the sea level, three kilometers from Gevgelija and six kilometers from the border with Greece. Around the spa there are three natural springs with huge reserves of subterranean hot water. Its thermal-mineral springs around which the spa facilities are built are located at the right side of the Vardar River, at the foot of mountain Kozuf, between the villages Mrzenci and Negorci, at 60 meters above the sea level. In the region of the spa, there are two waters- Hot Spa, with temperature of 40 degrees centigrade and Cold Spa with 38 degrees. This is the only spa in the country that also has thermal mud, located at about 500 meters south of the thermal springs. It is sand-like, almost black with light-dark particles of vegetative origin, with temperature between 34 and 36 degrees, which makes it very good for Peloid therapy. The presence of this thermo-mineral NEGORSKI SPAS mud in Macedonia creates conditions for enlarging the therapeutic possibilities in Negorski Spas, for which a project is being prepared. The water in the spa has healing features for all types of rheumatic illnesses of the knuckles and muscles, sterility, gastrointestinal illnesses, cardiovascular conditions, inflammations of the periphery nervous system, different types of dermatological illnesses. Drinking the sulphuracid water heals kidneys’ inflammations, gastritis and stomach ulcer. The spa is equipped with modern equipment for electro-therapy, paraffin therapy, as well as underwater massage. Negorci thermal-mineral springs are of volcanic origin. At a depth of about 20-50 meters, the thermal-mineral water springs out on the surface in a form of squirt, which proves that beside the existence of the thermal water in a natural way in Negorski spas, there is also arterial thermo-mineral water. These thermomineral waters have high temperature, which is different at different springs, and is between 36 degrees in the cold spa to 43 degrees in the new tapping. The total richness of all three springs, the cold, hot spa and the new tapping, is 1,80 liters per second. The water in the springs is rich in sulphur, iron, fluor, chlorine and magnesium. More massive use of the healing features of this water started at the end of the 19th and the beginning of the 20th century, in the period when this area was ruled by Shukri Pasha, nobleman of the Ottoman Empire. He built a building with two pools and room for resting. He bathed in the first pool, and his nine wives bathed in the second pool. One of the pools is bigger with circle shape, and the other is in a form of cube. These facilities even today are used and called “Pasha’s bath”. The legend says that the healing water in the spa was used even earlier and that the mother of Alexander the Great bathed her son there, and because of that the local people call it “Alexander’s spa”. Around the spas, on area of 22 hectares, there is rare sample of black ash, which refreshes the air, makes the surroundings more beautiful and offers long walks and relaxation for the visitors. At 27 km is the site “Smrdliva voda” where Negorski Spas have their own facilities at 730 meters above the sea level. In the spa complex, there are three hotels, sports fields and fitness center, which are completely reconstructed with an aim to offer a pleasant stay of the visitors. The “Jasen” hotel is the best, with capacity of 126 beds, then the “Ilinden” hotel, which has 88 beds, while the “Bozur” hotel offers accommodation for 68 persons. Because of the mild climate, numerous sunny days during the year and the richness of hyper-thermal mineral springs, with temperature between 47 to 72 degrees, this natural healing place has been used since Roman times. The spa is located on the road to the border crossing “Novo Selo”, near Strumica, on the border with Bulgaria. It is 30 km from the border and 12 km from Strumica. There are 13 natural springs around the spa, with huge reserves of subterranean water, whose warmth reaches 72 degrees. The water has excellent results in treating stomach diseases, diabetes and gynecological diseases. There is a rehabilitation centre in the spa, where medical stuff is engaged. The rich and various forests, as well as the fresh air around the facility, enable relaxation and treatment of all types of rheumatic diseases, sciatic and polyarthritis, diseases of the digestion organs, such as ulcer and gastritis, as well as bones’ fractures. The spa water heals the body after hepatitis, has positive influence on the nervous conditions, and successfully treats genealogical conditions as sterility and inflammation of ovaries. Within the spa, there is the “Car Samuil” hotel, located at the foot of the mountain Belasica. 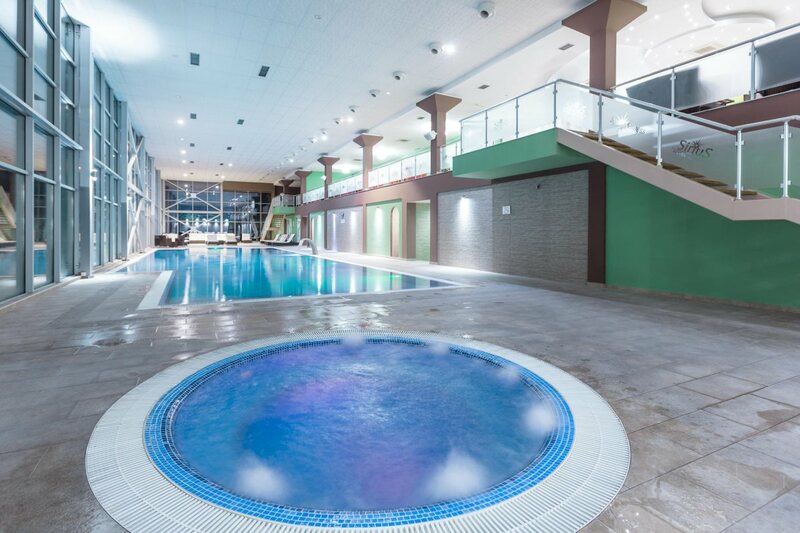 This is a B category hotel, with 240 beds, and has two semi-olympic pools and one for physical therapy, with fully equipped part for hospital therapy and medical rehabilitation, as well as other rooms for sports, BANJSKO SPA recreation and entertainment. Located in the Banjsko Spa is the Institution for Protection and Rehabilitation, where persons with minor physical handicaps are being taken care of, rehabilitated and educated, with capacity of 65 beds. There are also thermo mineral waters, with temperature of 70 degrees, which go down to 37 degrees, five kilometers from Kocani. 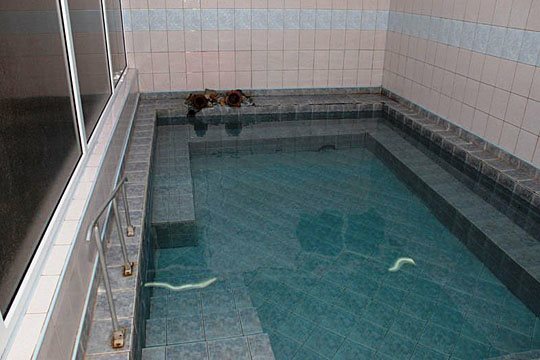 The water in Kocani Spa has excellent healing features for digestive, skin and rheumatic diseases,as well diseases of the liver. The picturesque valley of the Radika River and the freshness coming from the babbling water, offers full relaxation and pleasure for the visitors of Kosovrasti and Banjiste Spas. Both spas, famous as Debarski Spas-Capa are located near the city of Debar. Their waters, whose temperature ranges between 38 to 48 degrees, contain sulphur-sulphide elements and are good for treating rheumatism, increased blood pressure, skin diseases and diabetes. Near the spas is the picturesque DEBARSKI SPAS -CAPA Debar Lake, the babbling canyon of the Radika River, mountain Shara, as well as numerous important religious objects and cultural-historic monuments from the past. Banjishte Spa is located 4 km from Debar and is famous for its healing features and radioactivity. The healing feature of the thermo mineral waters is a result of the chemical composition: sulphate, many rare elements, hyper-thermal feature, compositions of dissolved gasses and high radioactivity. Within the spa there is a center for physical medicine and rehabilitation. The spa also has accommodation capacities and pools for physical therapy. At the shore of the one of the most beautiful artificial lakes in the country- Debar lake, the Kosovrasti Spa is located. It is in the Radika River valley, 8 km east of Debar, on the road to Skopje, at 55m above the sea level. The thermo mineral water of the spa, according to the sulphur content, is ranged at the third place in the world and is one of the most radioactive, which enables treatment of wide spectrum of diseases. Both spas are especially famous and visited for treatment of rheumatic diseases, conditions of the nervous system, diseases of the gastric and intestinal system, problems with the respiratory system, diseases of the urological and genital system, endrocrynological diseases, orthopedic conditionsand conditions after traumas, skin diseases. The spas are completely reconstructed and have indoorand outdoor pools, parks and restaurant. Almost half of the visitors of these spas are foreignquests. Kezovica Spa is located on the southeast exit from Shtip to Strumica. The thermal waters that reach temperature of 62 °С have very favorable chemical composition and are rich in natrium chloride, natrium sulphate and silicium oxide. These waters are efficient in treating rheumatism, knuckles conditions, nervous conditions, diabetes, infertility and reduced potency. The healing water also prevents early ageing, treats skin diseases and increased blood pressure. The water from the springs is used for drinking and bathing. Because of the variety of minerals it contains, the biggest radioactivity in the Balkan it has, with temperature between 57-70 degrees, it is used for inhalation and treating some lungs conditions. There are also healing water springs at 3 km of Kumanovo and 13 km from the closest border crossing. The mineral water from Kumanovo Spa has a temperature of 29-21 С and contains calcium and natrium. It treats nervous conditions, digestive system, kidney conditions and diabetes.